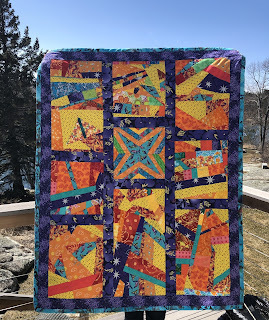 The oversized “crumbs” are dramatic and will certainly light up the operating room as this quilt wraps a child on the day his or her life changes forever. Thank you, Ann, for sharing your creativity. What a wonderful few days I had recently in New Hampshire, meeting new and old friends, and promoting Wrap-A-Smile. 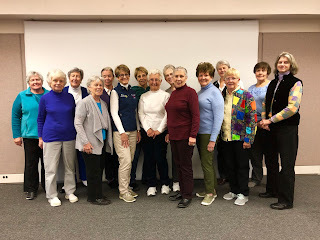 First stop was Seabrook, NH, where Friends and Stitchesmeets every Tuesday at the Seabrook Library to sew charity quilts. They choose a different charity every year, and this year the lucky recipient is Wrap-A-Smile. I expected to see fabric and whirring machines, but instead they put aside their projects for a day to host me and share a luncheon. 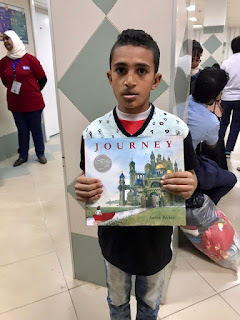 My typical presentation starts with a brief introduction about Rotary International, then describes a Rotaplast mission (using my photos from the Togo mission in 2011 when my husband and I were part of the team), and then moves on to the story of the quilts. 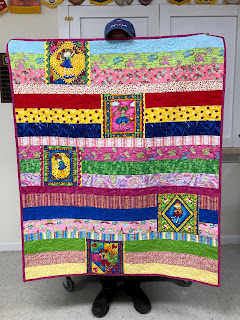 Interestingly, three different ladies shared stories with me about family members or friends who had repaired clefts, a good reminder that it really does still occur here in the U.S.
A fun idea for an easy children's quilt was shared at our semi-annual Quiltathon last Saturday. Wrap-A-Smile adviser and friend Jackie M brought 2 quilts which she made by cutting up panels and rearranging with layers of stripes. Easy peasy, and very colorful! Our second Quiltathon was a huge success. With 13 quilters, new T-shirts designed by Colleen G's granddaughter, and plenty of homemade soups and cookies to keep us fortified, the pile of quilts grew and grew. Counting finished quilts which were delivered to us, plus our day's efforts, we ended with a glorious pile of 76 more Wrap-A-Smile quilts to ship to the medical missions. Good work everyone! It was cold and snowy in Maine and I was needing a fabric fix so I headed off to Maine-ly Sewing in Nobleboro. My friend Marjorie who owns Maine-ly Sewing is always good for conversation and I wanted to check out her new inventory. An unexpected surprise for me was meeting her friend Debbie who sews many of the display quilts which so richly decorate her shop. 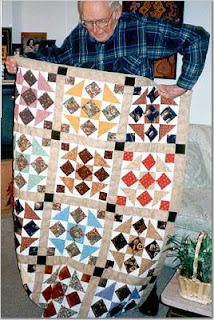 As the conversation bounced from one thing to another, Wrap-A-Smile was mentioned, and Debbie announced that she had a stockpile of the display quilts at her house....and would love to share them with me! Oh, and as she comes to Boothbay Harbor frequently, "where could she drop them off"?